Today’s field watch is the direct descendant of the military watches that first appeared on the battlefields of WWI some 100 years ago. They’re typically tough, water resistant and built to withstand difficult environmental conditions but they don’t typically veer as far from conventional stylings as do tactical watches. While the popularity of field watches waned somewhat during the latter part of the 20th century they’ve made an impressive comeback in recent years and are currently one of the hottest trends in wrist watches. Our review panel has selected what they consider to be the 12 best field watches currently available. The Expedition Field Watch from Timex resides among the very best looking field watches on the market. Right up there with the Szanto Military Watch and just about anything from Hamilton. This Timex watch features patented Indiglo illumination in the hands and numerals of the face, a clock with 3 sub-dials that can be programmed multiple ways and is both incredibly tough and thoroughly water resistant. It has a well-crafted leather strap that’s comfortable and generously proportioned and a tachymeter function that you can use to calculate your speed and/or the distance to a given object. Definitely in the running for best field watch under $100. Hamilton makes some of the most attractive field and tactical watches on the market today. They seem to have been created just for this purpose as they rarely if ever miss the mark with their solid, timeless designs. The H70455733 (say that 3 times fast) is yet another example of how effectively they incorporate aspects of both dress watches and tactical watches into their field timepieces. This Hamilton watch has one feature we’d like to see in all outdoor watches in that it’s self-winding. It also sports a GMT scale, military time inner circle, scratch resistant sapphire crystal lens and is water resistant down to 50 meters. But beyond all the impressive technical aspects this watch just looks great. With its leather strap, lustrous stainless steel casing and modest proportions it’s a winner on the hunt or in the office. A little pricey, sure. But worth the stretch, especially for a gift. The Luminox Atacama looks like the field watch of the future but fully embraces old-fashioned virtues of quality materials, outstanding utility and rugged durability. It’s a beautiful watch with Swiss quartz movement that never flinches and a no-nonsense stainless steel casing that will take most anything that comes its way. The classic profile of the Atacama is anchored to a genuine leather strap that’s a manly 26mm wide and exhibits clean lines and robust stitching. Tritium inserts on the hands and at the hour markers mean you’ll never have to worry about the watch going dark due to lack of sun exposure during the day. Everything on the face is easy to read with the “12” glowing orange after dark so you can always obtain proper orientation. The watch is also water resistant down to 100 meters. The Atacama is a true hybrid in every sense and one that manages to balance its various influences beautifully. Be sure to also check out our list of the best survival watches for more great items like this. The Bertucci A-5P Black Camo Illuminated Field Watch is one of the few we’ve included here that unabashedly embraces its battlefield heritage. From the carbon fiber reinforced casing to the self-illuminating tritium tubes on the hands and the camo-nylon band it’s a watch that deserves to be in top 3 on our list. The nylon camo strap sets the tone for this outstanding piece of outdoor survival kit from Bertucci. The carbon fiber unibody case of the A-5P is built to withstand the sound and fury of the Howitzer and the sapphire crystal lens gives no quarter to branches, dirt and grit. 24-hour military time is marked out in the inner circle of the face and that time will always be accurate thanks to the precise Swiss quartz movement. If you’re looking for contemporary performance with traditional strength and durability the A-5P from Bertucci is for you. Our handy guide to the best military watches features more great products like this. 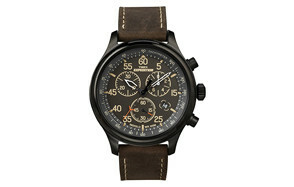 Bertucci hits another home run with their A-2T field watch. This one fits the same basic mold as their camo model (reviewed above) but takes a slightly different track to greatness with its solid titanium screw-down crown that prevents moisture from intruding under the sapphire crystal lens. It’s a watch that’s ready for anything the battlefield or the polo field can dish out. Robust battery life, flawless timekeeping, water resistance to 50 meters and an easy to read analog face with 24-hour military time are all aspects of the A-2T that will endear it to you in short order. Add to that the fact that it’s just as ‘at home’ in the office as it is on the mountainside and you’ve got a high-quality field watch that understands its dual nature. This watch won’t bowl over those looking for tactical watch features and frankly, it’s not supposed to. It will, however, bowl over anyone who appreciates quality workmanship in a rugged, good-looking, all-purpose timepiece. The Citizen Men’s Eco-Drive adopts a rough-around-the-edges look to drive home its military field watch roots. By juxtaposing the ruggedness of the nylon strap with the smooth sophisticated finish of the stainless steel case the designers achieve a nifty balance that makes the watch as visually intriguing as it is dependable and useful. This Citizen watch is built for comfort and durability. The face is simple and easy to read the band broad and tough, the hands and numerals clearly visible when the sun goes down and the stainless steel casing gives the watch substance without making it too heavy. Ideal for camping, fishing, biking, jogging and a hundred other outdoor activities that don’t include getting lost hiking in the mountains. Best of all you can have it for less than 100 bucks. Seiko have taken a slightly different approach to field watch design with the SNZG13. They’ve basically taken one of their dress watch templates and beefed it up for the outdoors with the result being a hybrid mechanical watch that hits the mark with both performance and looks. The SNZG13 field watch eschews the standard nylon or leather straps you’ll see on most of its competitors and puts its faith in stainless steel. As a result you get a watch that’s incredibly strong from clasp to face, that’s waterproof down to an incredible 330 feet, that self-winds the way all outdoor watches really should, and whose self-illuminating hands are as easy to read in the heat of battle as they are in the peace and quiet of your family tent at night. The perfect combination of style and outdoor function. Love this product? Check out our review of the best titanium watches for our top picks. Hamilton may have a habit of giving their watches annoyingly long numerical names but that doesn’t in any way detract from those watches being among the best values in the contemporary marketplace. The H70575733 (whew!) is as handsome a field watch as you’ll find anywhere and the solid titanium case means it’s also one of the toughest. Hamilton hits all the marks with this field watch. From the black PVD titanium case to the easily readable face and Swiss movement. The sapphire crystal is incredibly scratch resistant and the whole thing can be taken to 330 feet below the surface before it starts to have problems. The nylon band is also one of the most comfortable we’ve experienced on a field watch. If what you’re after is a field watch that takes no prisoners the H70575733 from Hamilton is the watch for you. Be advised however that titanium is not cheap, and neither is this watch. Find more great products like this by checking out our guide to the best Daniel Wellington watches. The A-1T from Bertucci is simplicity incarnate. The whole thing looks like it has about 3 moving parts with 2 of them being hidden from view. Seriously though we can’t think of another watch design that’s refined down to the essential elements the way the A-1T is. Nonetheless, this field watch makes great use of Swiss quartz precision behind a screw down titanium crown to create something pretty special for under 200 bucks. If there’s such a thing as extreme comfort the A-1T has it. It’s light enough to be worn for days without the 2-ply nylon band ever giving you trouble. The face shows just the quarter digits, incorporates design cues that can trace their origin to WWII military watches and is easily readable day or night, good weather or bad. The mineral glass case is highly resistant to scratching and the hands glow like neon signs. Throw in the fact that it’s waterproof to 100 meters and you have a field watch for the ages. Our guide to the best pilot watches offers more great products like this. Everyone on the review team was impressed by the simple strength exhibited by the design of the Szanto Military Field Watch. It’s a bold-faced throwback to vintage motifs yet somehow manages to feel perfectly 21st century at the same time. 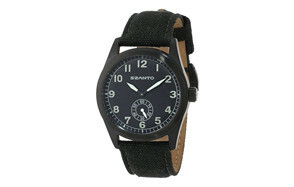 Szanto makes their bid for field watch immortality with this stunning military-inspired timepiece. Fabricated from aircraft grade aluminum with a soft black nylon strap and scratch-resistant sapphire crystal lens this watch will look just as appropriate on the shooting range as it will in the big sales meeting. The taupe background, 12/24 hour numbering system, precision quartz movement and self-illuminating hands make for a field watch that any style-conscious outdoorsman (and there are a lot of them) would be proud to own. Perhaps the best field watch for under $200. If you love watches, make sure you also check G-Shock watches review. 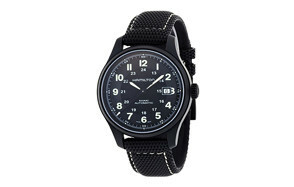 Because 1 Szanto beauty is not enough we round out our list with the company’s SZ1003 Military Field Watch. With precise quartz movement, a tough as nails mineral crystal lens, a fluted crown and water resistance down to 100 meters this field watch is not only seriously handsome it’s seriously functional. The face beneath that beautiful crystal lens is clear as a bell with tastefully bold numerals that self-illuminate. The surrounding case is high grade stainless steel with a rich black ion PVD plating that’s a perfect visual foil for the wheat colored canvas strap. Everything is perfectly proportioned and the watch as a whole is dependable and remarkably affordable. Sailors, horsemen, backpackers and more will find a lot to like in the SZ1003. You may also like our selection of the best sports watches so check them out. The Seiko Men’s SNE331 Core Solar Field Watch bears more than a passing resemblance to the Szanto SZ1003 and that’s okay, considering the Szanto is one of the most attractive field watches on the market. The Core Solar however, can be had for about half the price and considering it embodies dependable Seiko quality and reliability that means it automatically warrants consideration if you’re looking for a field watch. The SNE331 Core Solar Field Watch sports a mineral crystal lens that resists all manner of scratching, a black stainless steel case, a remarkably soft nylon band that’s also remarkably comfortable and a push/pull crown. It’s also water resistant down to 330 feet and features luminous hands and numerals along with a luminous orange orientation triangle at 12 o’clock. It’s very tastefully executed, built to last and can be had for about 100 dollars. Our Tag Heuer watches guide offers more great products like this. If you’ve never heard of a field watch before you’re bound to have questions, as do most people. Below we’ve compiled 3 of the most common field watch related questions we encountered during our research on this type of outdoor watch. Q: What Are Field Watches? A: As we mentioned at the top of this piece a field watch is a descendant of the best military watch that came into wide use during the First World War. Those watches were actually reworked version of women’s wrist watches of the day (men at the time did not wear wrist watches, they used pocket watches) that were given a rugged edge to make them palatable to the male audience. Today the descendant of the military watch is widely used by men engaged in less than extreme activities and occupations and yes, they’re still used by soldiers in the field. Q: Why Do I Need A Field Watch? A: There are a multitude of reasons why someone would need or want a field watch. First off, if you regularly engage in outdoor activities you know how dangerous they can be to your expensive dress timepieces. You still need to tell the time however and so enter the field watch. Some of the most common purchasers of field watches include sailors, soccer players, equestrian athletes, army officers, policemen and women, contractors and more. Q: What Is The Best Brand Of Field Watch? A: This is a very difficult question to answer given how many high quality field watches are on the market today. Nonetheless we would have to come down on the side of Bertucci as being the manufacturer who produces field watches that more or less define the genre today. The typical Bertucci field watch is beautifully balanced and rugged with outstanding visual potency and an array of usable, dependable features. They can also typically be had for a fairly reasonable price. When it comes to choosing the right field watch for your wrist there are a number of things to consider that should and will weigh on your decision. Below we’ve listed some of the most important considerations in the hope that this information will help you find just the right field watch match for your needs. Power Source – Quartz movement is precise and is distinguished by ticking as the hand lurches forward from second to second. Mechanical motion by contrast tends to be smooth. That is, there is no stop/start action as there is with quartz. Quartz movement is battery powered while mechanical motion is derived from a coiled spring. Another option is the self-winding watch which derives its energy from your motion. As you walk a pendulum like device inside the watch slowly swings back and forth providing the movement needed to wind the watch. In our estimation any true tactical or field watch should be self-winding and not dependent on batteries or manual winding. Water Resistance – Since a field watch is not likely to be exposed to the kind of environmental abuse a tactical watch will encounter it is not typically necessary for it to demonstrate the same degree of water resistance. Still, a field watch should be water resistant enough to withstand landing in a puddle or being exposed to rainfall for extended periods of time. 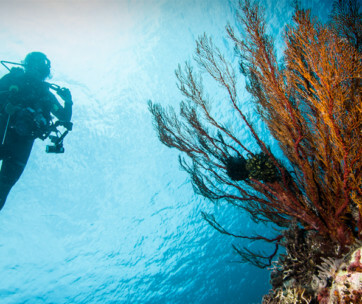 If it’s not rated to at least 50 meters you’ll likely want to take a pass or checking out a deep sea scuba watch. Luminescence – You’ll want the hands and numbers on your field watch to be luminescent. They should be clearly visible on even the darkest nights. There are several ways to achieve this. One way is by having hands and numbers that soak up solar energy during the day and release it at night. Another way is to backlight the face of the watch so that everything is visible. And the third and best way is to have hands and other features that self-illuminate using tritium gas. Face Type – Some people will prefer an analog face, others a digital face. It’s really up to you which one you choose. A few types of military field watch will have both an analog face and a box that displays the time digitally in 24 hour military format. For a field watch such an option is largely redundant. The most important thing is that, whichever face style you choose, it be easy to read both day and night. Size and Weight – While a field watch is typically smaller and lighter than a tactical watch it is still a fairly large device and you’ll want to make certain the one you’re strapping to your wrist isn’t too large or too heavy for you. If you’re a big guy you should be able to wear any of the larger watches listed above with no problem. There are also a number of smaller, lighter field watches available such as the Szanto Military Watch and the Timex Expedition that will look great on thinner arms. Durability – We now get down to the heart of the matter because, let’s face it, the field watch is all about durability with other considerations being just that; other considerations. If you anticipate asking a lot of your field watch you’ll want to consider one with a titanium or polycarbonate case that will shrug off all manner of shocks and impacts. Otherwise look for high quality stainless steel or aircraft grade aluminum. There is more than one watch out there that claims to be a field watch but is composed mainly of plastic (to be sure none of these watches made our list). You’d be wise to avoid these like the plague. Strap – In some very real ways the wrist strap is the most important part of the field watch. It’s the strap after all where the rubber meets the road or, more accurately, where the watch meets the wrist. Field watch straps come in a variety of materials from composite rubbers to stainless steel, to leather, nylon mesh, canvas and others still. The strap should never bind your skin or cause irritation, even if you’ve been riding your horse in the rain for several hours. 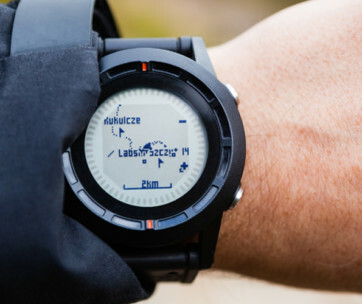 Additional Features – Whereas a tactical watch may offer everything from an alarm clock to GPS for hunting capability, an altimeter, barometer and more a field watch will typically be fairly light on the features and what features there are will be more related to build quality than bells and whistles. That is, you’ll see things like a titanium casing rather than a barometer. That’s because you typically aren’t going to ask as much of a field watch as you will a tactical watch. Price – At the end of the day it all comes down to price and how much you’re willing or able to pay. While there isn’t a field watch on our list that is outrageously expensive several are in the $400+ range (under $1000 range) which is nothing to sneeze at. If you’re working within a limited budget fear not; there are still field watches out there that deliver outstanding build quality, compelling looks and useful features for fairly short money. Today’s field watch has come a long way from the rudimentary models strapped around soldiers’ wrists back when Woodrow Wilson was President. Today they’re fashioned from state-of-the-art materials including titanium, carbon polycarbonate and sapphire and are driven by power sources that simply didn’t exist 100 years ago like Lithium-ion batteries and self-winding mechanisms. Many of today’s most attractive field watches also comfortably double as dress watches; they’re that good looking. If you’re looking for a high quality field watch consider one of the models reviewed above and use the “things to consider” list to help make your final decision. We hope you found these field watch reviews helpful and don’t forget to stop by again soon for more review guides from your friends at gearhungry.com.